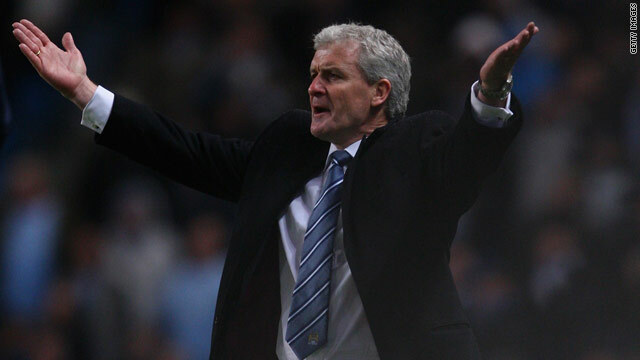 Mark Hughes' Manchester City team have lost just twice in the league this season, but have drawn eight times. (CNN) -- Big-spending Manchester City have made a surprise move to sack manager Mark Hughes and appoint former Inter Milan coach Roberto Mancini in his place. City sent shockwaves through the club's support by announcing during Saturday's English Premier League match at home to Sunderland that an announcement about Hughes' future would be made later in the evening. Sixth-placed City won the game 4-3, and former Manchester United and Wales striker Hughes appeared to wave goodbye to the crowd as he disappeared down the tunnel. City later confirmed on the club's Web site that the 45-year-old Mancini, a former Italy international, would take over the reins "on a permanent contract" -- but did not reveal the length of the deal. "Prior to the current season beginning, with significant investment in players and infrastructure in place, the consensus between the board and coaching staff was that appropriate agreed targets should be set for the 2009-10 season," said chairman Khaldoon Al Mubarak. "The targets were agreed as a result of the player acquisition strategy of the club being radically accelerated in the summer as a result of very favorable conditions for any buying club. It was also based on the fact that the infrastructure of the club had been overhauled completely at great cost in order to create the best possible environment for the team. "A return of two wins in 11 Premier League games is clearly not in line with the targets that were agreed and set. Sheikh Mansour and the board felt that there was no evidence that the situation would fundamentally change. Hughes' team have suffered the fewest defeats of any team in the Premier League this season, losing just twice, but eight draws in 17 outings -- including a record seven in a row -- left City outside the Champions League places. The club's oil-rich Abu Dhabi owners bankrolled Hughes' transfer plans in the off-season as he spent $185 million in signing Carlos Tevez, Roque Santa Cruz, Gareth Barry, Emmanuel Adebayor, Kolo Toure and Joleon Lescott, having paid a British-record $52 million on Brazil star Robinho in August 2008. Mancini will be assisted by former Manchester United player and coach Brian Kidd, who steps up from his role with City's youth team. He has been out of work since leaving Inter at the end of the 2007-8 season, when he led the club to the Serie A league title, after which he was linked with Chelsea and, more recently, English lower league team Notts County. "Roberto is a hugely experienced manager with a proven track record of winning trophies and championships. His experience and track record speak for themselves," Al Mubarak said. "What is absolutely clear is that Roberto believes in Manchester City's potential to achieve at the highest level and importantly in his own ability to make this happen. My hope is that our incredible fans will join us in welcoming Roberto to the football club."